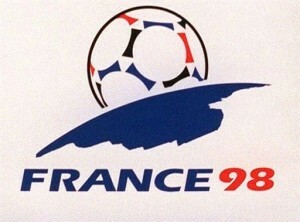 TM had bad preparation leading up to the 1998 World Cup that consisted of poor results in friendly matches and a coaching change less than one month before the tournament began. Former TM player Jalal Talebi took over for the dismissed Croat Tomislav Ivic. Iran’s first match was against F.R. Yugoslavia in Saint Ettiene. TM were considered to be heavy underdogs and to make matters worse, captain and leader Ahmadreza Abedzadeh would not be starting in goal due to a knee injury. The younger and inexperienced keeper Nima Nakisa would be tested by the dangerous Yugoslavs. Defender Nader Mohammadkhani would wear the captain armband for this match. Surprisingly, Iran played well and didn’t look one bit like the team that got pushed around in friendly matches leading up to the tournament. Mehdi Mahdavikia had a shot on goal in the first half that went straight at keeper Ivica Kralij. Later in the first half, nice ball movement by the Iranians led to an excellent opportunity for Mehrdad Minavand inside the Yugoslav penalty area but he sliced his left-footed shot agonizingly wide. His reaction afterward said it all because it was the perfect chance for Iran to take the lead. The Iranians held firm and played tight defense throughout the match but at times started playing more physical. In the 72nd minute, the Yugoslavs had a free kick outside the penalty area. Free kick specialist Sinisa Mihaijlovic made them pay and blasted a left-footed shot around the Iranian wall past Nakisa to give Yugoslavia a much needed goal. TM did their best to keep on fighting. Late in the match a cross from Mehdi Mahdavikia was headed by striker Ali Daei but keeper Kralj made a nice save to help Yugoslavia hold onto the 1-0 victory. Next, Iran would take on USA in Lyon. The media had anxiously been awaiting this match since the draw in December 97 because of the political history between the two nations. The game took place on FIFA Fair Play Day. The Iranians brought flowers for the American players and both teams stood together in a group photo as a way of showing the world that politics had no influence in the World Cup. USA got off to the better start and even hit the post early on. Both teams desperately needed the win as the Americans previously lost 2-0 to the Germans. Karim Bagheri had an attempt on goal from well outside the penalty area but keeper Kasey Keller didn’t have to work too hard to make the save. The Americans put on more pressure while the Iranians were looking to play the counter attacks. Late in the first half, a move started by Bagheri in his own half led to some nice ball movement deep into USA’s half of the field. Mehdi Mahdavikia found Javad Zarincheh just outside the right side of the penalty area, his cross was met near the penalty spot and headed home powerfully by midfielder Hamid Estili to give Iran a surprising 1-0 lead. The American players were stunned. They had made the better chances in the first half and found themselves down 1-0 going into the interval. USA kept on attacking in the second half. David Regis hit the outside of the post near the hour mark and later on a throw in was flicked on nicely by the head of Brian McBride and went to an unmarked Frankie Hejduk in the penalty area. Hejduk nearly found the equalizer but Abedzadeh made a crucial save to keep Iran in the lead. In the 84th minute, Mahdavikia received a perfect pass from Ali Daei and beat the offside trap. Mahdavikia was all alone racing down the field, took a shot that grazed the hands off American keeper Keller but it wasn’t enough to keep it out. Iran lead 2-0. Three minutes later Iranian keeper Abedzadeh missed the ball on a corner kick and it was headed in by forward Brian McBride to cut the lead to 2-1. The goal by McBride meant that the last minutes and four minutes of stoppage time would be intense as the Iranians would sit back and try to hold onto the lead. TM held for the 2-1 win and earned their first ever victory in a world cup match. Iranians all over the world celebrated and city of Tehran came to a standstill as people partied all night in the streets. Team Melli and Iranian supporters were riding the momentum of the victory against USA but next they would face heavy favorites Germany in Montpellier. For the third consecutive game, Iran held their opponents without a goal in the first half and some were wondering maybe, just maybe, could Iran find a way to pull off an upset draw? All those thoughts were quickly wiped away after Oliver Bierhoff and Jurgen Klinsmann scored goals in the 50th and 57th minutes to give Germany a 2-0 win. It was natural to be a little sad that Iran lost to Germany but the Iranian players returned home as heroes for barely losing to Yugoslavia, beating USA, and fighting hard against the Germans. Iran qualified to France in dramatic fashion with the 2-2 tie against Australia and they definitely earned the respect of the football world with their performances in the 1998 World Cup in France. More Iranian footballers in the future would find themselves playing in European football leagues because of their return to respect in the football world. Looking back, the tie against Australia has proven to be the most important moment in the history of Iranian football.